“Go Figure” is an exhibition by artist Tania Smith and sculptor Allan O’Loughlin currently showing at Arts in Oxford. Tania Smith’s artworks are big, bold and dynamic and reflect her fascination with people and passion for life drawing; her artworks on paper in Indian ink, acrylic and pastel are the accumulation of 3 years figurative work. 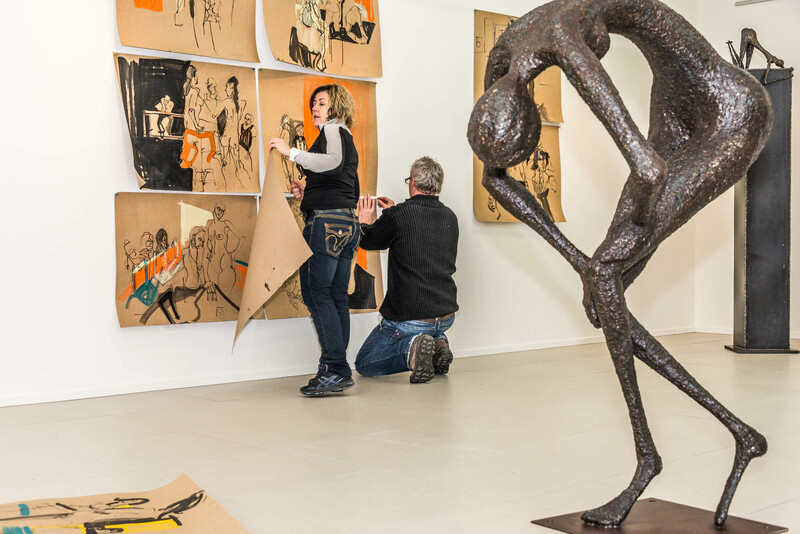 Allan O’Loughlin’s elegant and quirky steel sculptures are the perfect partner to Tania’s drawings; the rusty, earthy colour of the arc welded steel creating stunning silhouettes against the backdrop of Tania’s works. Their opening night of their exhibition “Go Figure” is on Thursday 15th August from 6 – 9.30pm at Arts in Oxford and is open to all who would like to come along.